Growing Brussels Sprouts requires a long growing period. It is a hardy, slow-growing, long-season vegetable belonging to the cabbage family. The "sprouts" that resemble miniature cabbages, grow in the leaf axils, starting at the base of the stem and working upward. 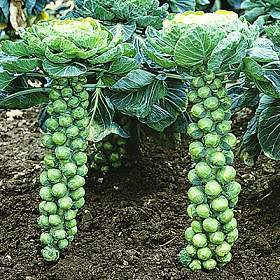 The sprouts will improve in quality and will grow best in cool or even lightly frosty weather. Most open pollinated varieties of Brussels Sprouts are harvested at intervals over a period from the bottom to the top as the sprouts mature. This is better for a family for a continuous harvest; instead of the newer hybrids, which mature more uniformly with more sprouts all at once. Optional: When Growing Brussels Sprout pinch out terminal buds (the buds at the top of the plant) to encourages rapid sprout development along the stem, particularly the upper sprouts - although this action will reduce the total yield. Harvest sprouts from the bottom of the stem to the top as they reach about 1" in diameter. Sprouts left on the plant too long become tough and lose flavor. Brussels Sprouts will produce seed the second year. 'Genius' - a late season variety. 'Oliver' - an early season variety. Medium green. Mild taste. 'Rampart' - a late season variety. 'Long Island Improves' - an old variety and is harder to produce heavy, uniform crop. 'Rubine' - red plants and sprouts. Late maturing.